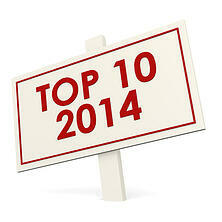 As 2014 winds to a close, we thought it would be interesting to revisit our most popular safety blog posts for 2014. Our most popular post of the year was on how to set effective safety goals for your company, a timely topic as safety managers plan for 2015. Safety audits may be conducted on a voluntary or required basis by knowledgeable, experienced professionals who will assist in reducing personnel risk and insure compliance with applicable standards and regulations. Audits are used to assess a company’s safety management systems, determine the use of corporate policies and procedures in regards to compliance, as well as to identify what regulations apply to a given area or facility. A Safety Scorecard is a set of leading indicators you can review weekly to track the effectiveness of your company's safety program at a glance. You can use a simple Excel spreadsheet to track these numbers each week against your goal. Hard hats are designed to protect the heads of workers from the risk of traumatic brain injuries caused by falling objects, impact with other objects, debris, bad weather and electric shock. The overall hard hat design has not changed much over the past 40 years but research has begun at the National Institute for Occupational Safety and Health to update and improve the overall construction of hard hats for better prevention of traumatic brain injuries for those in the construction industry. The first step in the research process is to evaluate the hard hats that are currently on the market and analyze how heads are protected from top and side impacts as well as how well the neck is protected as the head swivels from an impact. Mechanical integrity and equipment deficiencies are frequently cited in OSHA inspections. In this blog series, we will cover the mechanical integrity shortcomings that are most commonly cited in third-party Process Safety Management(PSM) audits. By paying attention to these common mistakes, you can avoid mechanical integrity citations in PSM audits. The Z10 Occupational Health and Safety Management Systems Standard, which was revised in 2012, provides guidance to safety professionals tasked with implementing safety management systems. The new standard, while requiring management commitment, emphasizes the importance of employee participation and feedback in the safety management process. Your Job Safety Analysis ("JSA") Program should be audited regularly to make sure that it is working as intended to help you reduce accidents. We recommend randomly selecting a sampling of JSA's from your files (about 15-20% of your total number of JSAs) for auditing. Thinking of tackling the writing of safety manuals and programs for your ISNetworld® compliance yourself? Most companies we deal with prefer to outsource the creation and maintenance of safety manuals to professional safety consultants, due to the time it takes. But, it is not an impossible task if you have a staff member with the time and patience to tackle it. When conducting incident investigations or job safety analyses, one of your tasks is to try to determine corrective actions to prevent an accident from happening in the future. In deciding what corrective measures should be implemented, OSHA's Hierarchy of Controls can provide a framework for determining the most effective corrective actions to undertake. Setting appropriate goals is a great way to improve your performance in any field, and safety is no different. How do you set the most effective goals? What types of goals should you set? And how do you track them? This blog post shows you how.